and evaluate f (1+e) we get D 1 4. We can directly read off f(1)=1 and f'(1)=4. The d i provide a basis for these infinitesimals. Computing g (7+d 0) (0+d 1) gives R 7.0 [1.0,3.0] so we know g(7,0) = 7, gx(7,0)=1 and gy(7,0)=3. Notice that in R this has many solutions. In fact, we find that onS (a*d 1,0) && onL (a*d 1,0) gives True for any Float value a. Does this mean anything? Actually, it fits some people's intuition of what the intersection should look like better than the usual idea that there is only one intersection point. 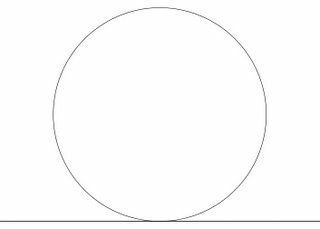 In fact, Protagoras argued that there was a short line segment in common between the circle and the line and that because Pythogoras's theorem gave only one solution the whole of geometry was at fault! Using R instead of the reals makes sense of this intuition. 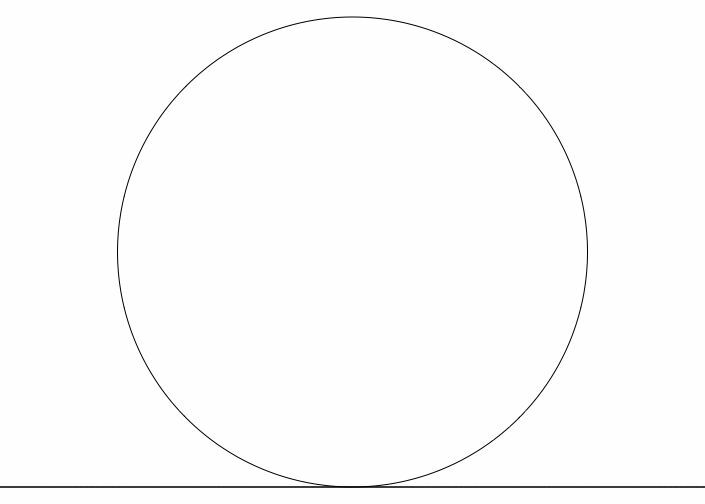 The points of the form (a*d 1,0) do, indeed, form a line tangent to the circle. In fact, there is a way to construct tangent spaces and vector fields directly from this - but instead I want to now consider Kock's construction which is slightly different. This simply translates along the x-axis infinitesimally. Of course this code defines a flow for non-infinitesimal values of d, but when considering this as a vector field we're only interested in when d is infinitesimal. transX defines a vector field that everywhere points along the x-axis. h (transX (d 1) (1,2)) == R 5  because h(x,y)=5 and hx(x,y)=2. and compare values of test1 and test2 at a variety of points to see if they are equal. For example test1 (1,2,3) == test2(1,2,3). I don't know about you, but I'm completely amazed by this. We can get our hands right on things like Lie brackets with the minimum of fuss. This has many applications. An obvious one is in robot dynamics simulations where we frequently need to work with the Lie algebra of the group of rigid motions. This approach won't give us new algorithms, but it gives a very elegant way to express existing algorithms. It's also, apprently, close to Sophus Lie's original description of the Lie bracket. Notice how, for example, onT (rotY (d 1) (0.6,0.8,0))==True, so rotY really does give an infinitesimal flow from the unit sphere to the unit sphere, and hence a vector field on the sphere. Compare this to the complexity of the traditional definition of a vector field on a manifold. Kock's book also describes a really beautiful definition of the differential forms in terms of infinitesimal simplices, but I've no time for that now. And I've also no time to mention the connections with intuitionistic logic and category theory making up much of his book (which is a good thing because I don't understand them). PS The D⊗D trick, implemented in C++, is essentially what I did in my paper on photogrammetry. But there I wasn't thinking geometrically. What's the preferred way to do higher derivatives? I found that e2 = D e 1 works, but it also calculates the first derivative twice. wgucg seems to contradict your calculation of that very example. For the second derivtive you need an element such that d^3=0 but d^2=0. Such an element can be found in R⊗R, as you've discovered. But, as you point out, you get the 1st derivative twice and it gets worse with higher derivatives. You can implement an appropriate algebra directly. One paper that does this is here. (That implements exactly the right thing, but doesn't give an algebraic description.) For arbitrary higher derivatives you're probably need power series code and there are many implementations of that in Haskell, at least for the single variable case. Michi, the code's correct, the 'comments' weren't. Now fixed. Thanks for the link. That's the only paper I've seen that formulates AD the way I do. Michael Shulman has an introductory lecture on synthetic differential geometry that starts out with dual numbers and eventually describes a Lie bracket. I don't know enough about Lie groups to know how his formulation compares to yours. Soooo... your Lie bracket is "just" the commutator of d(x)1 and 1(x)d in the tensor product, right? Is this just me being WAY to used to the algbraic point of view thinking that this is almost tautological? d(x)1 and 1(x)d commute so their commutator is zero. In fact, both of the algebraic structures I define are commutative. The Lie bracket comes from the non-commutativity of the vector field functions, not the underlying algebras. Geometric calculus is what you get when you combine calculus with geometric algebra. SDG provides an alternative approach to calculus. So the two should happily coexist. In fact, the code here can be combined with this latest code without problem and I guess that some of the language of geometric calculus turns directly into usable code in a nice way. You should be able to use it with Bloggger but I don't know how. Is this a spelling mistake, is *Pythagoras* spelled like this or is this just another guy? Koch's book (nice link, btw--i have a first edition, but did not know there existed a second) defines higher order nilpotent (?) differentials (or these little dual number guys, whatever you want to call them). And I WILL ask the question: What does this stuff have to do with "Geometric Algebra", Clifford Algebras, Grassmann Algebras, Supersymmetry, anything you can handle ... ? Did i succeed in leaving a comment or not? I guess i'll have to wait and see. I hope (?) i might get notified by email if i did succeed in leaving a comment ... ? and you can immediately calculate higher derivatives! I'm not sure this is a correct definition of vf: "f (f d x)==f x + d*vf x" Especially because f is supposed to map into R.